ASCII Character Chart (Miscellaneous) - TACKtech Corp.
ASCII stands for American Standard Code for Information Interchange. ASCII was developed a long time ago and now the characters are not always used in the same way on some machines. 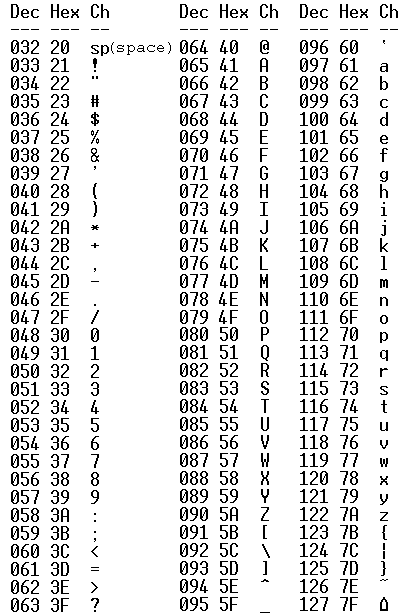 Below is the ASCII character table and this includes descriptions of the first 32 characters. 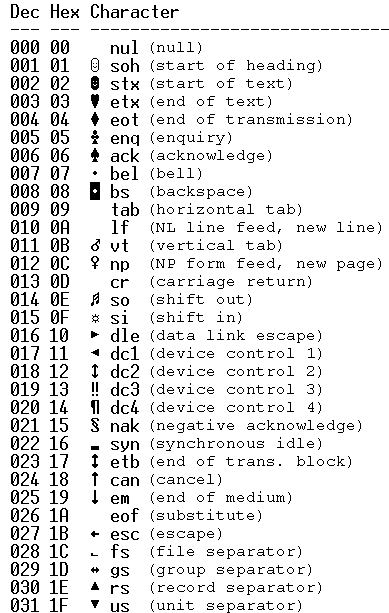 ASCII was designed for use with teletypes and so the descriptions are somewhat obscure and their use is frequently not as intended. These characters occupy DECIMAL numbers 128 through 255. The characters may change slightly depending upon the CODEPAGE used. Characters reflected herein are dependent upon the US CODEPAGE set. These characters are typically entered by holding down the ALT key, and typing the DECIMAL value of the character on the NUMERIC key pad. 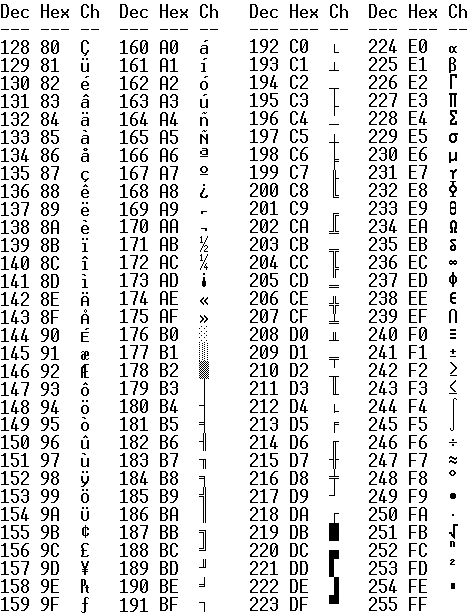 Some ASCII text editors allow simple provisions for inserting certain Extended ASCII characters, particularly the "Line/Box Drawing" characters. Some Word Processing programs (e.g. WordStar) also incorporate these special characters for formatting purposes. In an IBM/Microsoft Windows environment, these characters may not be displayed properly unless the Print Driver selected can support these characters. Many of the Epson Print Drivers CAN support these extended characters. Special Postscript programs can generate these characters to Postscript print devices.